The Toyota Land Cruiser Association is THE Cruiser Head's haven. They are the world's second largest four wheel drive club, and reinforce why we cruiser heads are so devoted to our rigs. Even if you aren't interested in participating in their runs and other events, their full color glossy magazine, Toyota Trails, is well worth the price of the annual dues. The Rising Sun Four Wheel Drive Club is my local chapter of the TLCA. Mark Whatley, Trey Williamson and others from our northern cruising outpost of Wasilla Alaska have conspired to plan and organize the Alaska Cruiser Trek. I believe this will be a TLCA sanctioned event in 2001. It will be limited to a small number of well prepped vehicles, keep checking their web site as details become available. Rich Adams has started the Land Cruiser Mailing List Registry, another great Land Cruiser site of interest. You do have to be subscribed to the Land Cruiser Mailing List, and register on the site. The Great Lakes Land Cruisers is the TLCA chapter out of Michigan. 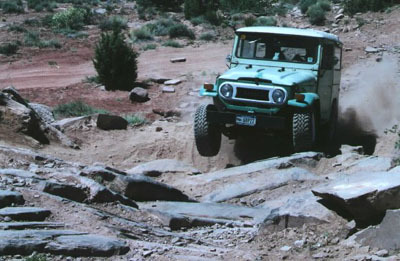 Moab 4x4 now is an excellent resource for Moab trail reports, maps and descriptions, even if they are a heep site. Another relativley new chapter of TLCA is the Northwest Cruisers of Idaho, based out of the Boise area. OffRoad.com has been nice enough to give us their server resources for years for the Land Cruiser Mailing List, this link takes you to the Land Cruiser Homepage of this informative and helpful site. Rockcrawler.com hosts a unique web site. This isn't a club or organization, but this site contains some of the best web inforamtion on Land Cruisers I have seen. It includes a several part writeup on waterproofing your cruiser, and how to safely do deep water crossings, and back country travel by Mark Whatley, and power steering conversion on a pig by Lance Williams. SierraRockcrawlers.com is a cool site. Good action shots and well designed. The True North Land Cruisers were the first TLCA sanctioned chapter outside the United States, and have an excellent web site. This is a link to Cosports Colorado 4x4 trails page. They have maps and trip reports on all sorts of 4x4 trails in Colorado. Great photos too! Colorado 4x4wheelin.com has some nice trip reports of some local trails. Northwest Cruisers of Idaho is a new chapter of The Toyota Land Cruiser Association. This link takes you to their homepage. OffRoad.Com sponsers the LCML, and this is the Land Cruiser Homepage on their site. The Pacific Mountain Cruisers of Northern California hompage has a bunch of cool cruiser stuff. Beach-N-Toys is the San Diego chapter of the TLCA. The Gotham City Land Cruisers is the TLCA chapter for New York. The X-Toys are an official TLCA chapter, they have a great web site, and seem to be dedicated cruiserheads! Yankee Toys is another Toyota sanctioned chapter of TLCA. Another great cruiser site.